Dragon War items are gaining quite the popularity lately, seeing they are affordable and also prove to be of a decent quality. Today we are able to present you with our opinion of their Dark Sector keyboard, which is very compact to house a dragon. Let’s hope it still has a fierce and fiery breath to get us through our gaming sessions. The Dark Sector is a decent amount smaller than other keyboards (with num pads) and this is due to the fact that all keys are placed right next to each other. The space bar has been reduced in size, as is the backspace key and the return key and a few others. This allowed the designers to fit in buttons like ‘Insert, Delete, Home, … ‘ into a single column, that connects up with the other buttons. As for the arrow buttons they are also incorporated next to the other keys, hence the smaller space bar and other smaller keys. This means that only the num pad ‘stands alone’ and thus a lot of room is saved. Dragon War opted for a very simple and sober look for its Dark Sector keyboard. Outside of the buttons there isn’t really an extra frame around the buttons. This means that the ‘buttons’ are pretty much all you will see when it comes to the overall design. Luckily Dragon War added some subtle features such as the logo on the space bar and the windows key. Nonetheless, for such a compact keyboard the design is fairly ok. Add a nifty looking blue LED-lighting, and the Dragon might surface a tiny bit. Comfort will surely leave some with mixed feelings. Whilst the compact size makes the keyboard hand to bring with you to LAN-parties, or save up some much needed desk space. Whilst this is a great plus, we can help but feel this made way for some much needed comfortable functions, such as overall comfort when using the keyboard. With the keys that are closer together, and the extra column next to the regular buttons you will have to get used to using the Dark Sector. You’ll often press the up arrow when wanting to press shift, or press other function buttons when aiming for the backspace or return buttons. This will result in a lot of typos or actions you do not wish to perform. That being said, after a while things get better when it comes to hand placement. The only problem is that, when you use another keyboard for a short amount of time again, you tend to have to get used to using the device once again. Another problem is the fact that the overall activation point of the keys feels quite off. Sometimes keys can be pushed quite easily, whilst at other times they either feel stuck or are a lot harder to activate. This is noticed the most when your fingers are more towards one of the corners or the sides of the keys. Whilst it’s normal to press a key at the center, the different lay-out/mapping of the keys will result in a different hand placement and thus you’ll often miss the center and this will result in a ‘stuck or harder to press’ key. Sadly, the keyboard also lacks the small ‘risers’ on the back that normally all keyboards have. This means you will always have to leave your keyboard flat on your desk, which makes the stuck buttons issues even worse. Luckily, the designers added a small rubber ‘foot’ in each of the four corners, in order to prevent it from slipping on your desk. Dragon War’s Dark Sector keyboard has a decent amount of basic features, that can be activated with the ‘Fn’ key. You’ll be able to access a decent amount of media functions, whilst pressing the Fn key together with the normal F keys. 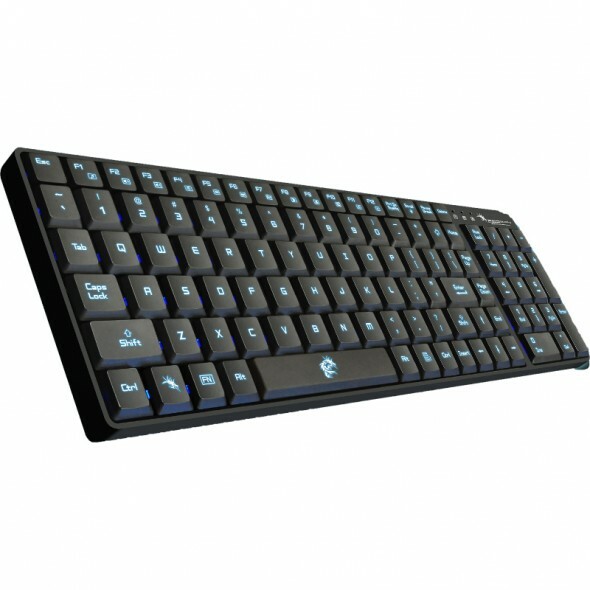 Illumination of the keyboard is also activated the same way. You’ll have to press Fn + Scroll in order to activate the full LED lighting in the keyboard. You’ll only have the option between full illumination or none at all. A fun feature Dragon War’s keyboard also has, is the fact it has quite a long connection cable. It’s roughly 1.8 meters in length, which is great for people with smaller rooms. It’s easy to put the keyboard close by, whilst watching a move in the comfort of your sofa, without having to get up all the time. Overall we feel the Dark Sector keyboard is marketed in a fairly wrong fashion. We would not really name this a gaming keyboard, but more a compact keyboard, that proves to be useful when on the road a lot. The lengthy cable proves to be a slight redemption of the overall poor comfort with keys that are hard to press or get stuck all the time. Perhaps not the best asset for your gaming set-up.